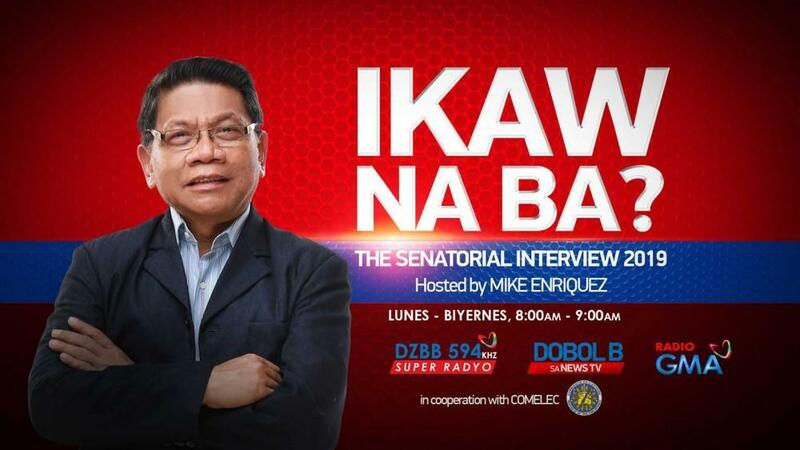 Super Radyo DZBB’s award-winning election special “Ikaw Na Ba?” returns beginning Monday, January 14, as it features senatorial candidates in the lead up to the 2019 midterm elections. Hosted by Mike Enriquez, “Ikaw Na Ba? The Senatorial Interview 2019” aims to help Filipino voters know the candidates better to enable them to make intelligent choices on Election Day. Named as the Best Educational Radio Program by the Catholic Mass Media Awards (CMMA) in 2011 and 2013, “Ikaw Na Ba?” is in cooperation with the Commission on Elections (COMELEC). Catch “Ikaw Na Ba? The Senatorial Interview 2019” starting January 14, Monday to Friday at 8:00 to 9:00AM on Super Radyo DZBB 594 kHz and Dobol B sa News TV, as well as on allRGMA Super Radyo stations nationwide.